Please see below for our latest Lakes & Mountains offers. Carlton Leisure Introduces Voucher Code to Travel Program! Leading Travel Agent Carlton Leisure has now set up a voucher code facility to help you generate those all important sales. At present any bookings made with the above airlines receive a higher rate of £10.00 CPA per booking. However, please note that where the above voucher code is used, Carlton Leisure will only be able to offer £5 CPA instead of £10.00. Carlton Lesiure do offer a live XML feed and dynamic search box banners. If you are not already joined to the Carlton Leisure affiliate program on AWIN, you can join here. Please contact cl [at] azam.net with any questions. See full terms and join the program here! We have a fantastic offer this week with a massive 80% off! Offering you food for thought whilst you drink your afternoon cuppa, this pretty pastel Cupcake Mug is printed with a colourful image of a traditional afternoon tea favourite with the words, ‘Have your cupcake…’ on one side, and ‘…and eat it!’ on the other. PLUS it is now a massive 80% off! The perfect companion for any trip away, the Dash-Mat is adjustable up to 3” wide to fit MP3 players and mobile phones, including iPhones. Plus the anti-slip, weighted base sits securely on the dashboard and will not slide as you corner. Light and portable, this bright LED Lantern is perfect for camping, walking or powercuts. It can be charged by the solar panel on its top or by winding the dynamo handle. Keep you children occupied and entertained in the holidays and at weekends with these great ideas in this book. Suitable for all ages, there are excursions and events throughout Britain – perfect if you need some inspiration during the Easter holidays. Make sure you check our latest Deal of the Week each week for an exclusive web only offer. This offer changes on a weekly basis so make sure you visit our website every week to see what savings you could make. This week’s special offers from Jet2holidays! With Easter just around the corner, we’ve got some fantastic last minute Easter holiday offers for you to promote to your customers. If Easter is a bit last minute for you, why not have a look at our 10 night All Inclusive special to Turkey from only £359 pp, a 2 night city break to Prague from only £166pp or an Algarve All Inclusive special from only £348 pp. Depart from East Midlands on the 5th May and stay in the TRH Torrenova Hotel. Depart from Belfast on the 5th May and stay in the Don Bigote Hotel. Depart from Leeds Bradford on the 6th May and stay in the Fuengirola Beach. Turkey 10 night All Inclusive Special! Depart from Newcastle on the 11th May and stay in the 3* All Inclusive Seray Hotel. Depart from Leeds Bradford on the 26th April and stay for 2 nights. Depart from East Midlands on the 8th May and stay in the 3* Monica Isabel Resort on an All Inclusive basis. *Please remember to replace !!!id!! with your affiliate id number. Natalie.simpson@affiliatewindow.com or Jo Addison jaddison@jet2.com for more info. Please remember to replace !!!id!!! with your affiliate ID number and check whether you are part of the main account (3427) or the tracker account (3760) and use the according link. It’s your last week to enter the Jet2holidays prize draw to win a £500 cash prize. All affiliates joined to the main account 3427 who generate 5 sales or more in March will qualify for an entry. Viking Ireland are running a competition on site right now to incentivise more customers to buy and higher AOV’s for all their supporting affiliates! Win a holiday to Poland! 10 nights bed and breakfast accommodation, airport transfers, transfers between Poznan and Gdansk and return flights from Dublin to Poznan for 2 people*! To enter simply place an order of €150 or more (excl. VAT) with Viking in one single transaction between 21st March and 10th May 2012, and your order will be automatically entered into the prize draw. Irish Viking customers will be entered into a competition to win a holiday to Poland. Customers will be entered into the prize draw automatically if they place an order of €150 or more (excluding VAT) within one single transaction between 21 March and 10 May 2012. *Remember to replace !!!id!!! with your affiliate id number. You can promote the prize draw to customers and also encourage customers to place an order over €150 to get an entry into the draw - every order the customer places will count so the more orders they place, the more chance they have of winning. The prize draw is being promoted on the Viking homepage, on weekly email campaigns and there’ll be inbox activity during April. If you have any queries about the promotion of this competition – please don’t hesitate to get in touch! New York Christmas Shopping with Jet2Holidays! Jet2holidays has announced the return of its hugely successful New York Christmas Shopping Breaks from East Midlands, Leeds Bradford International, Newcastle and Glasgow airports. The three night breaks are available for £699 per person, including return flights, 10kg hand baggage and three-star hotel accommodation. Shopaholics can secure their festive weekend package holiday to the city that never sleeps today, for a wallet friendly deposit of just £60 per person. •	Leeds Bradford International and Newcastle Airport to Newark Airport for two shopping weekends on Thursday 29th November, returning Sunday 2nd December and Thursday 6th December, returning Sunday 10th December. Please contact Natalie.simpson@affiliatewindow.com or Jo Addison jaddison@jet2.com for more info. Superbreaks: Top 10 Essential Offers! With our ever growing range of travel breaks, we thought we’d base this week’s offers on travel & hotel breaks. Customers can now travel by rail, Eurostar, ferry and coach. Leave the stress and worry of car travel behind and arrive into the Capital in style with Grand Central. With spacious seats, Wi-Fi access and power sockets in the majority of carriages your journey will be hassle free. Departure stations include: Bradford, Sunderland, Hartlepool, Pontefract, York and many more. You can also add a great selection of attraction tickets to your rail break, from the Tower of London to sightseeing tours and much more there is something for all to enjoy. Enjoy the convenience of return rail tickets from any East Coast Station, 2 nights in one of our superb hotels and the choice of fantastic UK locations such as London, Edinburgh and Leeds. What’s more, with very few travel restrictions and bookable extras such as travel insurance, you can relax in the knowledge that we have got everything covered. More value and choice added to our ever growing rail offers! First Great Western is a fantastic way of travelling to and from London. Rail deals available into London from over 30 departure stations across the South West of the UK. Leave the stress and worry of car travel behind and arrive into the Capital. An overnight cruise gives you a chance to relax and enjoy some of the great on-board entertainment and facilities available with P&O. Amsterdam is one of the world's most colourful cities, and is famed for its tree-lined canals, relaxed atmosphere and world-class museums. Take in the Van Gogh Museum then make your way towards The Rijks Museum, those more interested in historical sites should visit the Anne Frank House. An overnight cruise gives you a chance to relax and enjoy some of the great on-board entertainment and facilities available with P&O. Bruges’ incredibly well-preserved medieval architecture makes it one of the most exciting tourist attractions in Europe. A visit wouldn’t be complete without a canal or carriage ride, sampling the chocolates and waffles, shopping for craft work, climbing the belfry or trying several of the Belgian beers. Breaks include return travel on Eurostar and overnight accommodation. Visit the City of Romance with our Eurostar Breaks to Paris. The high-speed, stylish and comfortable journey from London to Paris by Eurostar takes approximately 2 hours 20 minutes, and you can enjoy quick and easy check in, reserved seats and an on-board bar buffet serving drinks and light refreshments. Travel in style on one of our Eurostar breaks. Enjoy a quick and easy check in, reserved and comfortable seats and a bar serving drinks and refreshments. Walk through the busy squares, and quiet cobbled streets, choose an intimate cruise on the romantic canals. Indulge in fresh from the sea mussels with chips and mayonnaise washed down with a speciality Belgian beer. Enjoy a short break in London and travel in comfort by coach. With ample leg room, air conditioning and plenty of space for your luggage it’s a relaxing way to start your break. We will make your seat reservation for you so we can guarantee you a nice comfy seat! Customers can travel stress free to either, Heathrow, Manchester, Gatwick, Newcastle or Stansted by booking a Superbreak airport by rail package. Booking couldn’t be easier, simply select your return date and the start station to price up the journey and confirm that you are travelling on an international flight. Following on from the release of his new album Tuskegee, Lionel Richie will embark on a supporting tour calling across the UK. Since he first entered the music scene in the early 1980s, Lionel Richie has become renowned for his array of hit songs, from the up-beat Dancing on the Ceiling and All Night Long to his huge catalogue of heart-felt love songs including Endless Love, Hello and the Oscar winning Say You, Say Me. Why promote Superbreak travel breaks? If you would like to hear more on the Superbreak Affiliate program then please contact us. If you're looking for inspiration for your next single holiday, look no further! Our selection of European and worldwide tours, ocean and river cruises, coach holidays and short breaks offers fantastic value - and if you want to get away soon, we still have some dates available in April and May. Click on the links to find out more but hurry, places are selling fast. Discover the historic sights and welcoming atmosphere of the city of Prague. You will be enchanted by the delightful Andalucian town of Mijas, which nestles in the foothills of the Sierra de Mijas Mountains above the coastal resort of Fuengirola. This pretty spot enjoys a tranquil setting and is an ideal location for a relaxing holiday. The romance of Tuscany comes alive on this popular and enjoyable holiday, with beautiful rolling countryside, olive groves, vibrant culture and famous landmarks. Enjoy delicious regional dishes with celebrated local wines. The small and charming seaside resort of Marina di Cecina is an excellent base from which to enjoy our exceptional selection of excursions. Immerse yourself in historic France. By coach from departure points nationwide. We have some great deals on European river cruises this week with savings of up to £200! The MV Serenade I is chartered exclusively by Page & Moy. On each cruise aboard this four-star cruiser you will be accompanied by two Page & Moy cruise representatives. The first-class on-board accommodation features the luxury of spacious cabins and bathrooms with both a shower and separate bath, which is unusual for a river cruiser. Built to the highest standards of safety and design, the MV Serenade I has something for everyone. Discover two of Europe’s most iconic rivers for your self on this superb cruise aboard the marvellous MV Serenade I. Stunning cities, attractive riverside landscapes and wonderful excursions await. Take a meandering journey along the Danube through Austria, Slovakia and Hungary. Admire the great cities and contrasting cultures all set amidst some of the finest scenery in Europe. Wind through some of Europe’s most beautiful river scenery. Experience fine architecture and wines in Germany and absorb the majesty of the Danube and the splendid city of Vienna. Discover the majesty of the River Danube, striking cities and stunning scenery on this superb cruise aboard the MV Serenade I. Discover attractive German, French and Swiss cities on this superb river cruise aboard the wonderful MV Serenade I. Starting and ending in historic Cologne, and with the option to travel to the ship by air or rail, it couldn’t be easier to discover the verdant vineyards and pretty villages of the Rhine valley. If you're looking for inspiration for your next holiday, look no further! Take a look at our selection of European & worldwide tours, cruises, journeys by rail and coach breaks. Every holiday offers fantastic value, with savings of up to £400 per couple available on selected departures - and if you want to get away soon, we still have some dates available in April and May. Click on the links to find out more but hurry, places are selling fast and this offer must end on 31 March 2012. On this exotic tour you will discover the magical and passionate ‘Land of Smiles’. The kingdom of Thailand, formerly Siam, embodies all the fascination and charm of the Far East in one beautiful and historic land. On this magnificent tour you’ll enjoy lunch amongst rice paddy fields, and stay overnight on a jungle raft. Discover the wonders of Shanghai, a fascinating blend of Chinese and colonial architecture, then head to Xian to see the incredible Terracotta Army. Your holiday ends in Beijing, where we include a tour of the city, visiting Tiananmen Square, the Forbidden City and more. Where else but in the Golden West could you find such an amazing collection of world-famous sights and a fantastic climate? Visit Las Vegas, Los Angeles and San Francisco; gaze in awe at the Grand Canyon, follow in the footsteps of the stars on a tour of Universal Studios, Hollywood; or relax amidst the glamour of Palm Springs. In just 16 days you could see more of China than you ever imagined possible on our ultimate tour of this fascinating country. Discover the vibrant city of Shanghai, the incredible Terracotta Army at Xian and visit the Pandas. Take a spectacular cruise on the mighty Yangtze and experience the grandeur of Beijing, home to the 2008 Olympic Games. This tour is a combination of north and South Vietnam in one glorious itinerary from Hanoi to Saigon. Visitors to Vietnam are overwhelmed by the sublime beauty of the country’s natural setting. Hauntingly beautiful mountains, a patchwork of brilliant green rice paddies, countless pristine beaches, and stunning rainforests and lagoons provide a serene backdrop to a 2,000 year old civilisation. Don’t forget that until the end of March, Secret Escapes is offering a £20 credit for all new sign ups during the month of March. Please replace !!!id!!! with your ID campaign. Offers are valid until 25th of March. Subject to availability. If not already get signed up to this program - Click Here Now!. Please get in touch if there is anything we can help you with and happy promoting. megabus.com are expanding their network to serve Boulogne, Paris, Brussles and Amsterdam! We have exciting new creatives for you to use in any promotions for the expansion and with services at more locations than ever, megabus.com is giving your visitors a wider choice of destinations, which will help to increase your conversion rate. megabus.com now serves Boulogne, Paris, Brussels and Amsterdam! 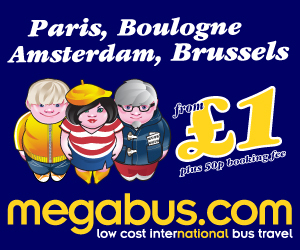 From Monday 16 April 2012, megabus.com will begin to operate services from the UK to Boulogne, Paris, Brussels and Amsterdam. Bookings to all 4 new destinations will be available from many points across the UK with a change of vehicle at London Victoria Coach Station. Passengers will require to check in and provide passport information prior to boarding the coach at Victoria Coach Station before departure for the ferry crossing to the continent via either Dover or Ramsgate to either Calais or Boulogne. Regardless of the port of arrival in France, all services will call at Boulogne to pick up and set down. Visit megabus.com for further details or to book! If your not already part of the program then please click here for more information. We would like to remind you that, Secret Escapes is offering a £20 credit for all new sign ups during the month of March. From £99 per room per night in Luxury Balcony room, inc. English Breakfast, glass of wine when dining in the Shelburne restaurant and use of the three-hole academy golf course. From £142 per room per night, inc. English breakfast, one dinner for twoon first night of your stay, one-hour full body massage for two and of champagne in the room on arrival. From £99 per room per night, accommodation in a Standard room. From £107 per lodge per night with Gaden view and breakfast included. From £209 per suite per night, accommodation in a Aqua Suite with private pool, inc. breakfast and 10% discount at The Spa by Paresa. From £91 per suite per night, inc. Buffet breakfast and bottle of wine and fruit basket on arrival. Pontins: Exclusive Affiliate Offer- Save Up To 15% On Summer Holidays! This offer gives customers up to 15% off their summer holiday bookings from 20th July- 3rd September! This landing page is avai lable for affiliates only! Pontins also have a brilliant Easter offer at the moment- with 25% of 3 night bookings starting on the 6th April, across all parks! Superbreak: Top 10 Essential Offers! As promised in last week's offers, here are more inspirational ideas for your Easter 2012 campaigns. With searches for 'Easter' seeing an increase of over 180% compared to last year, there's no time like to present to start your marketing campaigns. There's something for the whole family, and couples alike, to enjoy: from Cadbury World to Chester Zoo and from Fawlty Tower to Murder Mystery breaks. As deals with dinner continue to be a great seller we didn't want to miss them out! So this week's deals with dinner are at the luxurious Malmaison & Du Vin hotels. Find your perfect hotel in London, Guildford or Manchester for enjoying Easter and you’ll also find a complimentary chocolate egg in your room for stays between 1 and 15 April 2012. To whet appetites still further, the promotion also includes full English breakfast and 25% saving when dining in the hotel restaurants. Radisson Edwardian Vanderbilt – London South Kensington, from £133 per night. Radisson Edwardian Mercer Street – London Covent Garden, from £223 per night. Radisson Edwardian Grafton – London Tottenham Court Road, from £145 per night. Radisson Edwardian - Manchester city centre, from £112 per night. If not already get signed up to this program - Click Here Now! From £99 per room per night, bottle of cava on arrival and airport transfers when staying four nights. Bookings 20-28.02-2012. Subject to availability. From £42 per apartment per night, inc. 20% discount on fine dining at Beaucliffes restaurant. Bookings 20-26.02-2012. Subject to availability. From £81 per room per night, inc. breakfast, bottle of wine and massage per person. Bookings 19-02-03.03-2012. Subject to availability. From £99 per room per night in a Superior room, inc. breakfast, welcome cocktail and bottle of wine when buying dinner for two. From £57 per room per night, inc. a welcome pack with snacks and beverages. From £92 per room per night in a superior room, inc. breakfast, wine on arrival and Spa voucher. From £179 per room per night, luxury Suite, butler style breakfast, bottle of wine in room and entertainment discounts. Bookings 30.01-19.02-2012. Subject to availability. From £995 per person for 4 nights with flights from London Heathrow, inc. buffet breakfast and return airport transfer. Bookings 02-12.02-2012. Subject to availability. From £169 per person per night in a Deluxe room, return travel on Eurostar and inc.buffet breakfast. Bookings 06-12.02-2012. Subject to availability. From £99 per room per night in a Deluxe room, inc. buffet breakfast and bottle of wine on arrival. From £151 per room per night in Junior Suite, inc. buffet breakfast. Bookings 05-11.02-2012. Subject to availability. From £226per room per night in a deluxe sea-view room, inc. half board and return airport transfer and half day sightseeing tour. From £130 per room per night in Superior room, inc. breakfast and bottle of champagne on arrival. Welcome to the First Bookable Holidays Weekly Bargain Deals! This week we have some top selling hotels in the hottest resort for this summer! For the golfers out there we have a fantastic 4* All Inclusive in Albufeira, in Portugal. Enjoy some of the finest courses in the world or just soak up the sunshine! With departure dates across the summer from as little as £299 per person this is a great option for your visitors that are looking for relaxed holiday in the sun. Our second holiday exclusive this week is the sun soaked Hauza Beach Resort in Sharm el Sheikh, Egypt. This is a brilliant 5* All Inclusive hotel will cater for all needs and with guaranteed sunshine the Hauza Beach is an Ideal getaway. Based on a family of four booking a room you could earn yourself £100 commission per booking! Our final offer for this week is the Sol Calas de Majorca in the Balearic's, This 3* All Inclusive hotel offers some fantastic children’s prices with from as little as £129! The facilities in the hotel are very child friendly, allowing the children to have a great time and meet new friends while the adults bathe in the Mediterranean sunshine. This offer really is the bargain holiday of the year so far! Flights, accommodation, food, drink, and entertainment for and amazing price of £224 per person! Our weekly deals can be accessed by adding the “Bargain Holiday of the Week” banner or skyscraper adverts or the text link which are available from the Bookable Holidays profile. So what are you waiting for, book one of these amazing bargain holiday deals. Join the Bookable Holiday’s program today and start earning! From £129 per room per night, inc. English breakfast and three-course evening meal. Bookings 14-06.02-2012. Subject to availability. From £141 per room per night in a sea-view room and inc. breakfast. Bookings 29-04.02-2012. Subject to availability. From £549 per person for 7 nights including return flights and free upgrade to half board. Bookings 30-05.02-2012. Subject to availability. From £131 per room per night in a superior balcony room with sea view, inc. buffet breakfast, four-course dinner from the a la carte menu on one evening and free entrance to thermal park. Bookings 30-12.02-2012. Subject to availability. From £124 per room per night, inc. buffet breakfast. From £151 per room per night in a deluxe double room, inc. breakfast and buffet dinner. From £89 per room per night, inc. breakfast and a full day tour with lunch and return airport transfers.